Max Ferdinand Perutz OM CH CBE FRS (19 May 1914 – 6 February 2002) was an Austrian-born British molecular biologist, who shared the 1962 Nobel Prize for Chemistry with John Kendrew, for their studies of the structures of haemoglobin and myoglobin. He went on to win the Royal Medal of the Royal Society in 1971 and the Copley Medal in 1979. At Cambridge he founded and chaired (1962–79) The Medical Research Council Laboratory of Molecular Biology, fourteen of whose scientists have won Nobel Prizes. Perutz's contributions to molecular biology in Cambridge are documented in The History of the University of Cambridge: Volume 4 (1870 to 1990) published by the Cambridge University Press in 1992. His parents hoped that he would become a lawyer, but he became interested in chemistry while at school. Overcoming his parents' objections he enrolled as a chemistry undergraduate at the University of Vienna and completed his degree in 1936. Made aware by lecturer Fritz von Wessely of the advances being undertaken at the University of Cambridge into biochemistry by a team led by Gowland Hopkins, he asked Professor Marks who was soon to visit Cambridge to make inquiries to Hopkins about whether there would be a place for him. However Marks forgot. However he had visited J.D. Bernal, who was looking for a research student to assist him with studies into X-ray crystallography. Perutz was dismayed as he knew nothing about the subject. Marks countered by saying that he would soon learn. Bernal accepted him as a research student in his crystallography research group at the Cavendish Laboratory. His father had deposited £500 with his London agent to support him. He learnt quickly. Bernal encouraged him to use the X-ray diffraction method to study the structure of proteins. As protein crystals were difficult to obtain he used horse haemoglobin crystals, and began his doctoral thesis on its structure. Haemoglobin was a subject which was to occupy him for most of his professional career. He completed his Ph.D. under William Lawrence Bragg. On the outbreak of World War II Perutz was rounded up along with other persons of German or Austrian background, and sent to Newfoundland (on orders from Winston Churchill). After being interned for several months he returned to Cambridge. Because of his previous research into the changes in the arrangement of the crystals in the different layers of a glacier before the War he was asked for advice on whether if a battalion of commandos were landed in Norway, could they be hidden in shelters under glaciers. His knowledge on the subject of ice then lead to him in 1942 being recruited for Project Habakkuk. This was a secret project to build an ice platform in mid-Atlantic, which could be used to refuel aircraft. To that end he investigated the recently invented mixture of ice and woodpulp known as pykrete. He carried out early experiments on pykrete in a secret location underneath Smithfield Meat Market in the City of London. 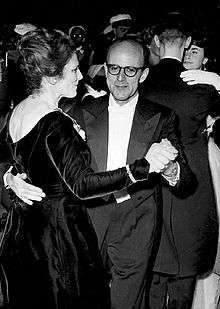 Perutz was made a Member of the German Academy of Sciences Leopoldina in 1964, received an Honorary doctorate from the University of Vienna (1965) and received the Wilhelm Exner Medal in 1967. 1 2 3 Blow, D. M. (2004). "Max Ferdinand Perutz OM CH CBE. 19 May 1914 – 6 February 2002: Elected F.R.S. 1954". Biographical Memoirs of Fellows of the Royal Society. 50: 227–256. doi:10.1098/rsbm.2004.0016. JSTOR 4140521. PMID 15768489. ↑ "Max Ferdinand Perutz facts, information, pictures | Encyclopedia.com articles about Max Ferdinand Perutz". www.encyclopedia.com. Retrieved 2016-10-09. ↑ "Max F. Perutz - Facts". www.nobelprize.org. Retrieved 2016-10-09. 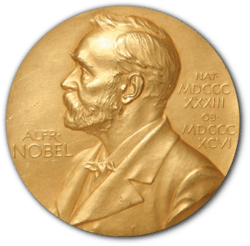 ↑ "This Day in Jewish History / Death of a Nobel chemist - This Day in Jewish History". haaretz.com. Retrieved 2016-10-09. ↑ Dickerson, Richard E. (2016-10-09). "Max Perutz and the secret of life, by Georgina Ferry". Protein Science : A Publication of the Protein Society. 17 (2): 377–379. doi:10.1110/ps.073363908. ISSN 0961-8368. PMC 2222719 . ↑ "Max Perutz OM". Telegraph.co.uk. Retrieved 2016-10-09. ↑ "Max Perutz Interview 2". The Vega Science Trust. Retrieved 19 June 2013. ↑ "Perutz rubbishes Popper and Kuhn". TSL EDUCATION LTD. 28 November 1994. Retrieved 19 June 2013. Dr Perutz, said: "It is one thing for scientists to oppose creationism which is demonstrably false but quite another to make pronouncements which offend people's religious faith – that is a form of tactlessness which merely brings science into disrepute. My view of religion and ethics is simple: even if we do not believe in God, we should try to live as though we did." ↑ Medawar & Pyke. Page 108. 1 2 Medawar & Pyke. Page 109. ↑ Fersht, A. R. (2002). "Max Ferdinand Perutz OM FRS". Nature Structural Biology. 9 (4): 245–246. doi:10.1038/nsb0402-245. PMID 11914731. ↑ Perutz, Max. Enemy Alien. I Wish I'd Made You Angry Earlier. pp. 73–106. ↑ Perutz, Max. Science is Not a Quiet Life. pp. 601–630. ISBN 981-02-2774-4. ↑ Gratzer, Walter (5 March 2002). "Max Perutz (1914–2002)" (PDF). Current Biology. 12 (5): R152–R154. doi:10.1016/S0960-9822(02)00727-3. Retrieved 12 January 2008. ↑ Ramaseshan, S (10 March 2002). 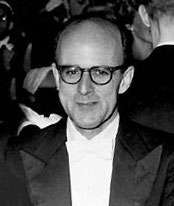 "Max Perutz (1914–2002)". Current Science. Indian Academy of Sciences. 82 (5): 586–590. Retrieved 12 January 2008. ↑ Collins, Paul (2002). "The Floating Island". Cabinet Magazine (7). Retrieved 12 January 2008. ↑ Medawar & Pyke. Pages 110 to 111. ↑ Perutz, Max (1998). "1–11". Science is Not a Quiet Life. World Scientific. ISBN 9789814498517. Fersht, Alan R. (April 2002). "Max Ferdinand Perutz OM FRS". Nature Structural Biology. 9 (4): 245–246. doi:10.1038/nsb0402-245. ISSN 1545-9993. PMID 11914731.